Stock market got you down lately? How about putting that money into the business of high-seas piracy instead? 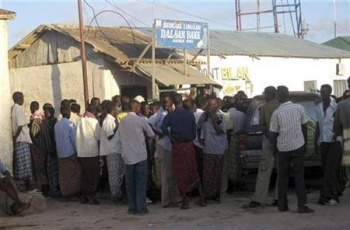 Somali pirates have opened what they call a "stock exchange" from their pirate lair in Haradheere, Somalia. Investors can donate money, weaponry, or other supplies and will see a return on their investments if the pirates complete a hijacking or other piracy goals. If you've ever wanted to be a pirate, here's your chance, because the pirates also are offering open recruitment from the lair if you just want to join up. Be aware that actual piracy is probably not as fun or glamorous as it is in videogames and movies. One woman donated a rocket-propelled grenade, which she got from her ex-husband in alimony, and says: "I am really happy and lucky. I have made $75,000 in only 38 days since I joined the 'company'." The town of Haradheere has been enriched by the venture, as a percentage of the pirate's ransoms are also going towards infrastructure such as the hospital and public schools. The opportunity is at least more interesting than buying low and selling high in Orgrimmar's auction house, though I'm not sure I would really trust a pirate to give me a proper return my investment. The situation may not actually be all that lighthearted, but it does seem like something out of a videogame, with pirates going on missions to earn as much money as possible for their community.